Sketchbook covers or storage bags? My intention was to make a sketchbook cover out of this wonderful fern fabric that I scored recently. The problem is I misjudged the size and cant fit the sketchbook inside. It’s to small. So I made another and did the same damn thing! To small! So what do I do with two book covers that don’t fit a book? Storage bags of course. One can never have to many, especially ones with fern fabric on them. The moral of the story here is always make bigger, you can always cut it down but you can’t make it bigger after quilting. Dense quilting makes the piece shrink a bit as does piecing which these have a lot of. 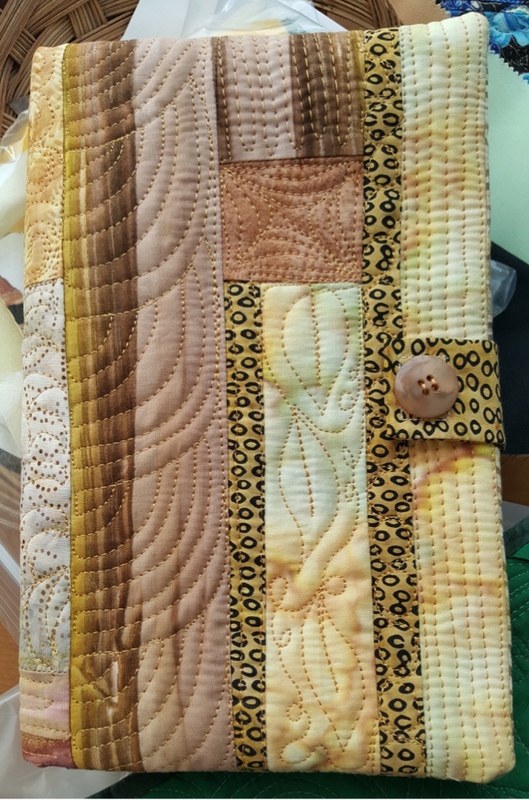 Next time I’m giving myself two inches all around, then will measure the book after quilting and see how that goes. This week I have another landscape to show. I just love making these. They are relatively easy and I get to okay with my “good” batiks. I tend to collect sky and water fabrics and this yellow is lovely. Remember when doing a landscape the sky and water should be similar. When you look at a lake from far away it generally reflects the sky whatever that might be. At least in my world it does. I’m off to enjoy the last of our beautiful fall days here in Vermont. The weather this year has been just perfect. We are truly blessed. The color isn’t as good as some years but sunny and in the high 60’s very day? What’s not to love. Does anyone use blogo for posting on blogspot? I had been using it and loving it bu for the last two weeks it crashes when I add a photo. Has anyone else had this problem? I am using another app but it’s not very good. I am participating in the art to fabric blog hop where for a week lots of quilt artists are making an art quilt having to do with mother earth and it also being inspired by another artist. That artist can be one that creates art in any form. 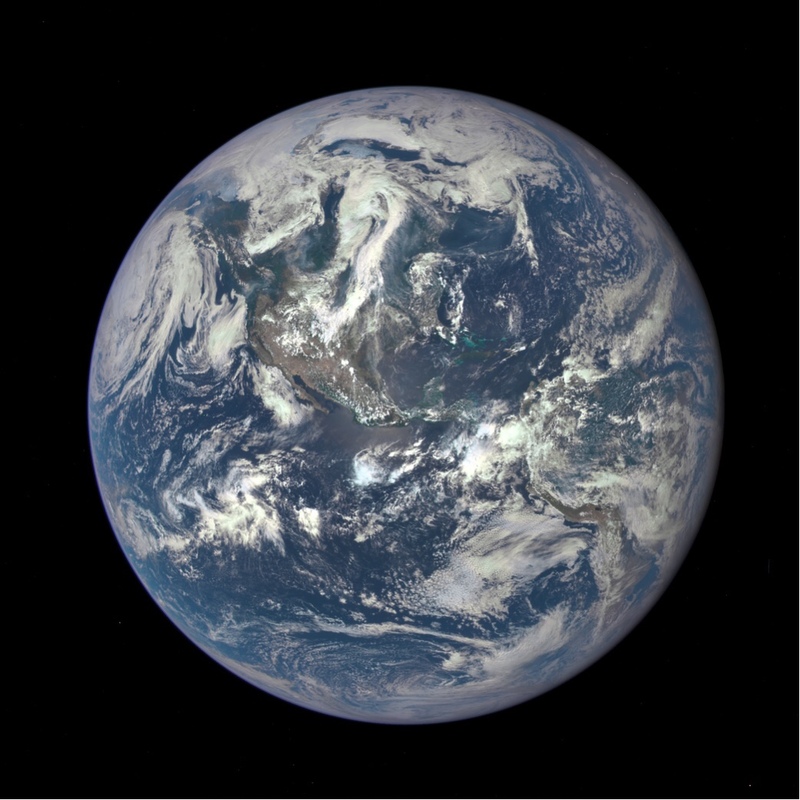 My mother earth was inspired by this photo taken by the Deep space climate satellite in 2015 using a special camera NASA uses combining a camera and a telescope. So the artist here would be NASA and the scientists. and if you ever want some inspirationor just enjoy looking at cool photos, go to the NASA images site here. To make the earth, I took a couple different shades of blue acrylic paint and poured it over a scrap of fabric, then rolled it around so it mixed but not to much. 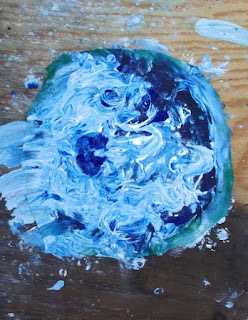 Then white paint was poured from a small cup over it, then swirled and rolled until I like the effect. It was then set out in the sun to dry. Being so thick it took a long time to dry - like days, but eventually it did. 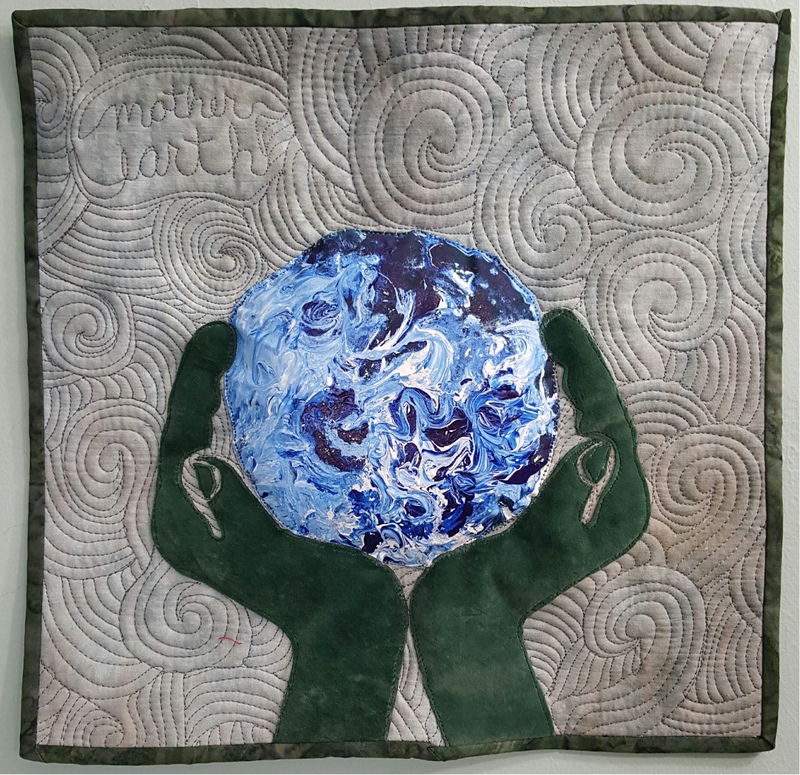 The painted earth was appliquéd to a background fabric and the hands were cut from a suede like fabric and attached using a fusible. After layering with a cotton batting, the whole thing was then quilted with an airy wind like design. 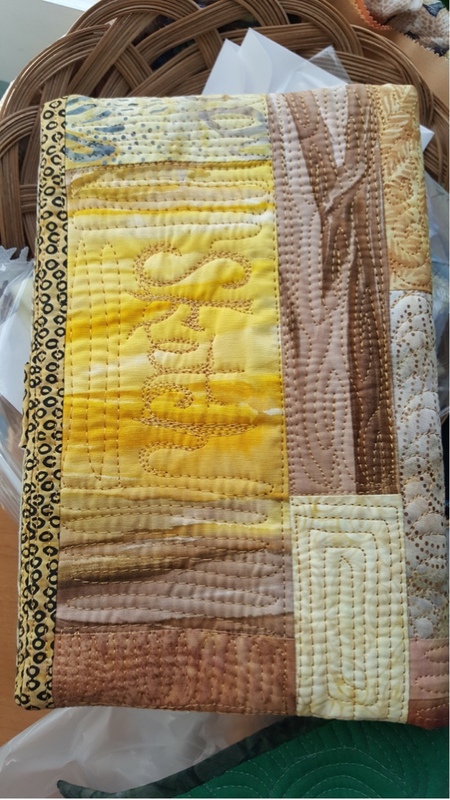 I’m very happy with the quilting. 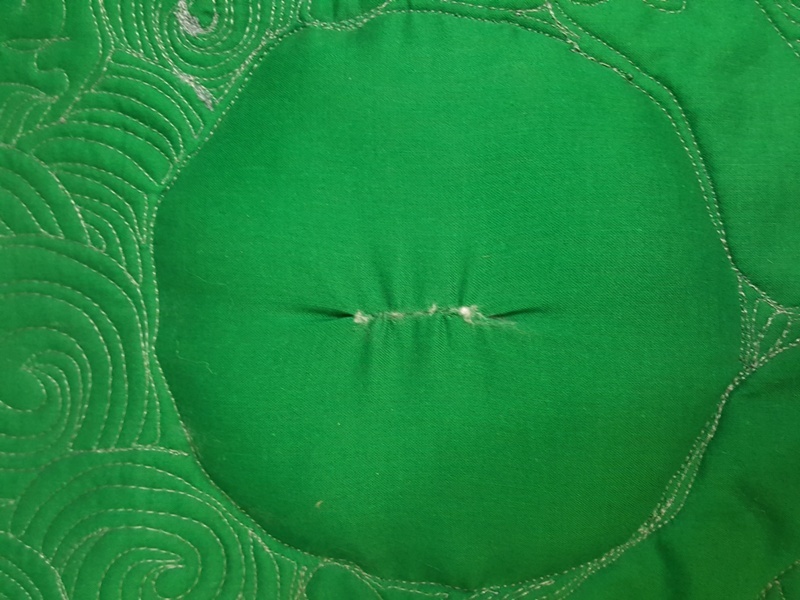 After binding the edges, the back was cut behind Mother Earth and stuffed with fiber fill to make it puff out. All in all it came out pretty although getting the paint to look like earth had more to do with luck rather than skill. I doubt I could make another. 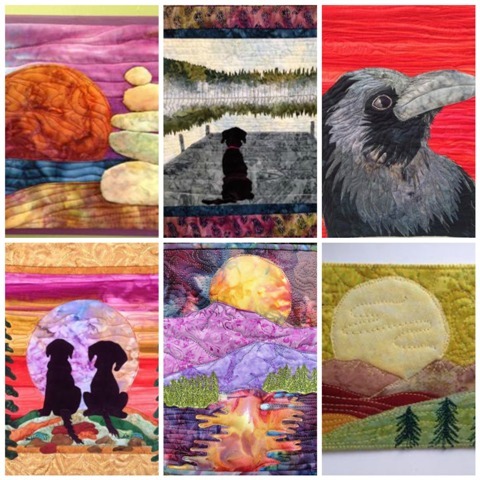 Here are the other quilt artists posting new today so go check them out. The hop started monday so click on the art to fabric button on the right to get a list of all the participants. Definately worth a look. I love seeing how everbody chooses different art and ways to convey “mother earth love” all creative and unique. Thank you Aida for getting this all together. 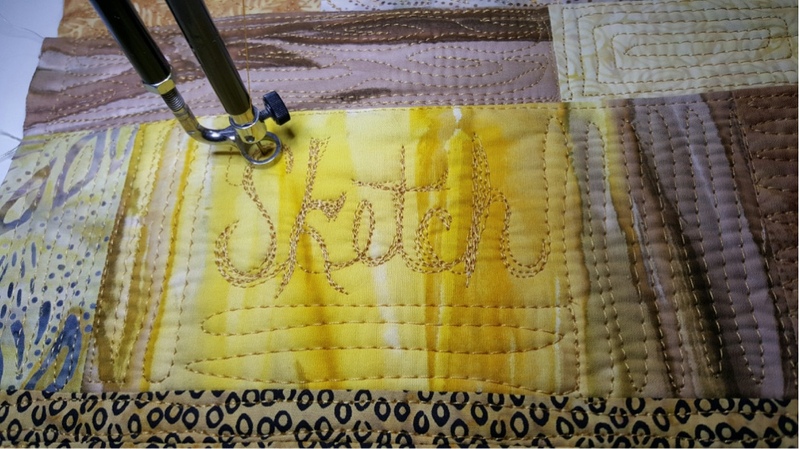 After listening to the new zealand quilt show podcast interview with lisa calle I feel the need to start a sketchbook. Of course I had to make a cover for it and forgot how fun these are to make! 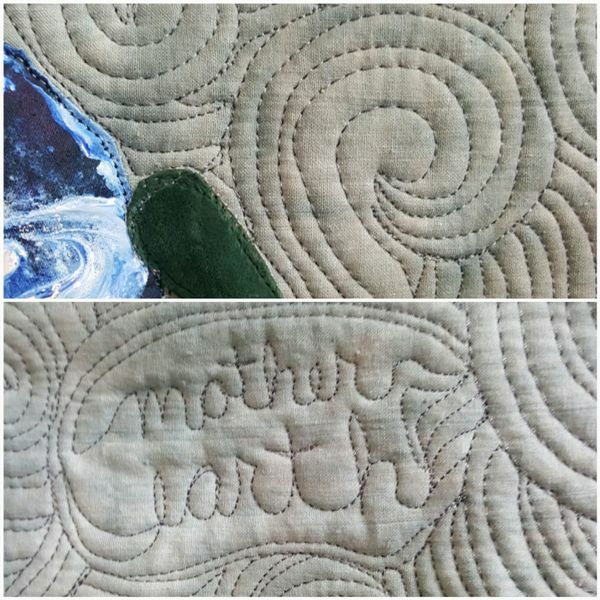 Note to self: when quilting words always write the word out on paper to look at . 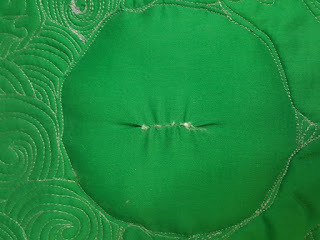 My brain can write with my hand but something about writing with the sewing machine - well things can go haywire. I first spelled sketch with a c instead of a k but saved it by putting in the k and making the word thick. 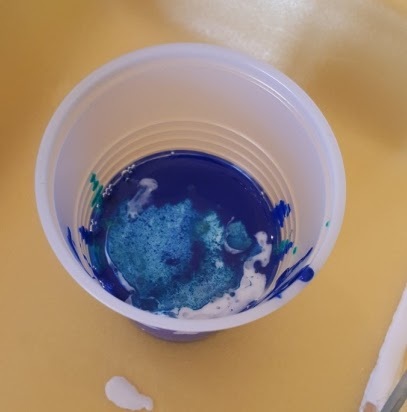 You can see part of the c inderneath if you know it there. 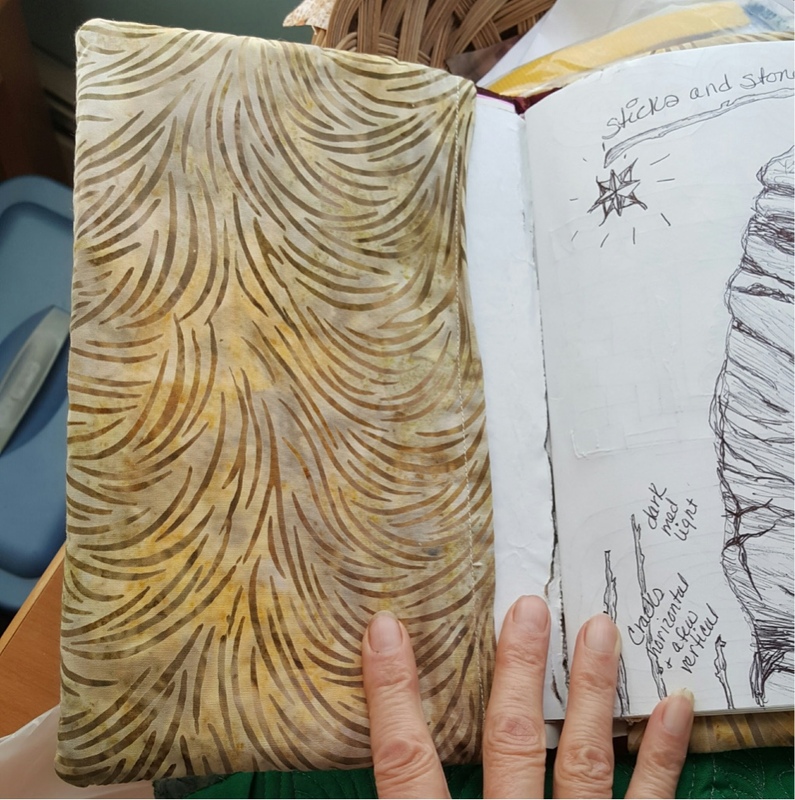 Why I am calling this an idea book is where the lisa calle inspiration comes in. This is my book. It didnt cost alot of money so no need to be afraid to feel like I have to put some masterpiece of sketching or drawing in here. Nobody but me is going to see it. I can doodle, write notes,, write ideas, draw something crappy and unrecognizable, write quotes - I can write my grocery list if I want to. The point is to USE IT! Its small enough to throw in my bag so I will have a place to mindlessly draw or doodle when I want to rest my brain. I hope you too will try having an "idea book"